“Race it, eventually. 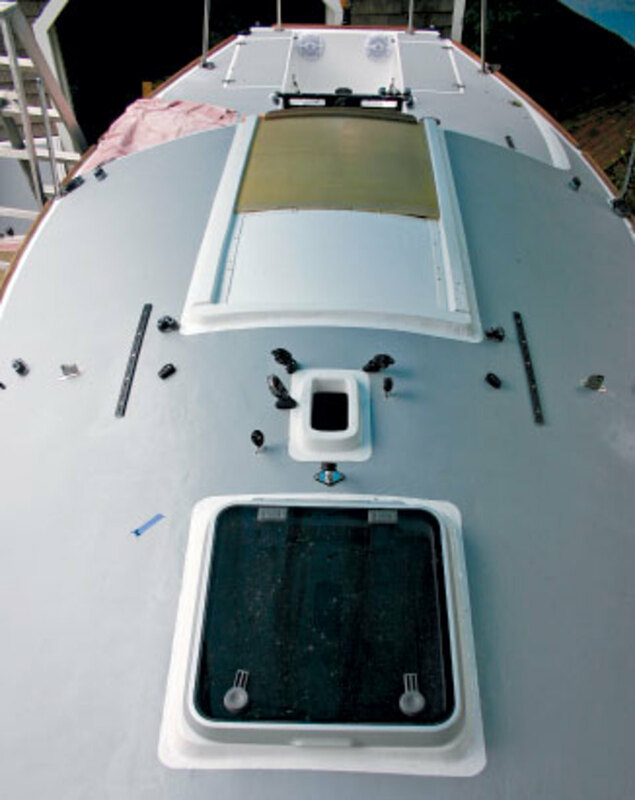 Here’s what needs to be done,” he said and pulled out a two-page list of repairs and upgrades he wanted to make on the boat. Fortunately, the purchase price was low enough to justify the cost of all the work he had planned. There was a reason for the long list. Built in 1978, the boat had been raced aggressively for 30 years and had then been allowed to sit idle for a year. Much of the wood on board was rotting; when I stood on the floors down below, some of them collapsed. 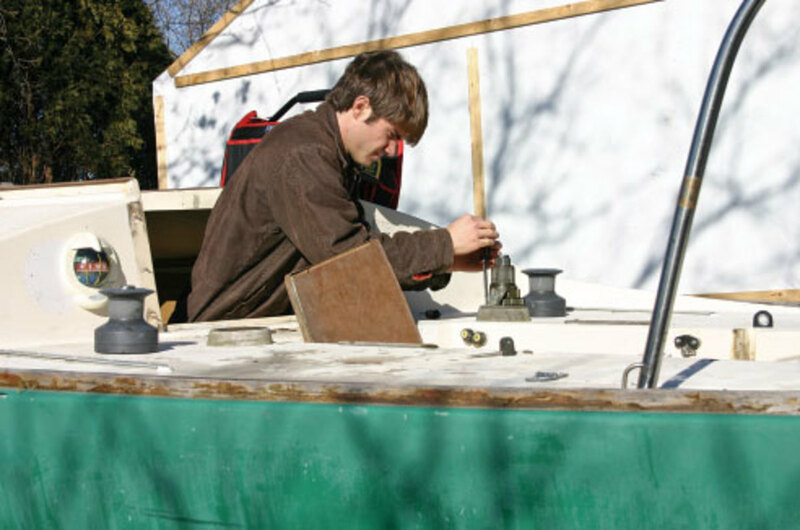 The bilge was full of soggy vermiculite, a material that is commonly used in potting soil to absorb water. Topsides, most of the deck gear looked to be as old as the hull, and much of it was original. Although the cockpit layout had worked well when the boat was built, it was clearly outdated by today’s standards. The one thing that convinced me David’s project boat would be alright in the end was the fact that its balsa-cored deck was not waterlogged. I agreed to help him with the restoration and we decided it would take one year to complete the project. By the time we finished it was pretty close to 18 months. We began by removing all the existing equipment: stanchion bases, pulpits, hatches and even the boom-box speakers. Next we replaced the two hatches and followed that up with a lot of sanding—a lot more sanding than either of us had bargained for. 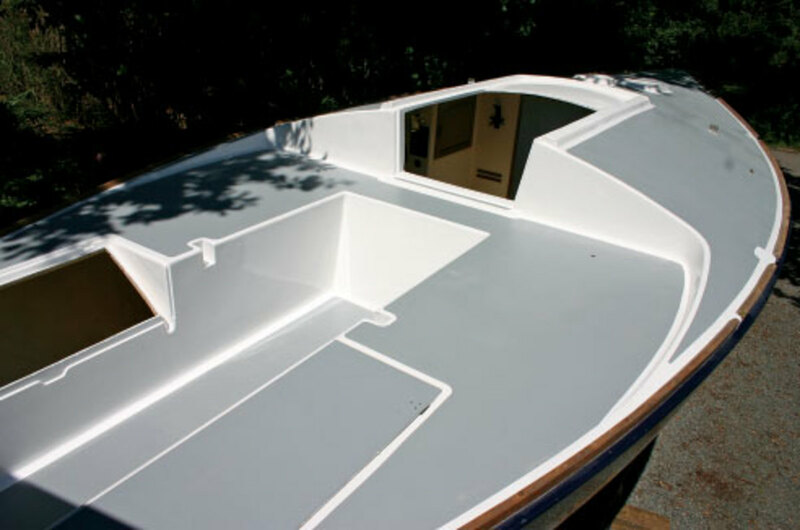 After we had sanded and prepped the hull and deck, we painted them using Interlux Perfection on the topsides and Interdeck non-skid on the deck. The final stage of the restoration involved upgrading the cockpit layout. Because we had fitted new forward and main hatches, the old layout was no longer usable because the new main hatch had a sea hood at the forward end and the sail control leads now were mounted on it. Much of the existing gear was badly worn, some of it broken. We decided to replace it all. 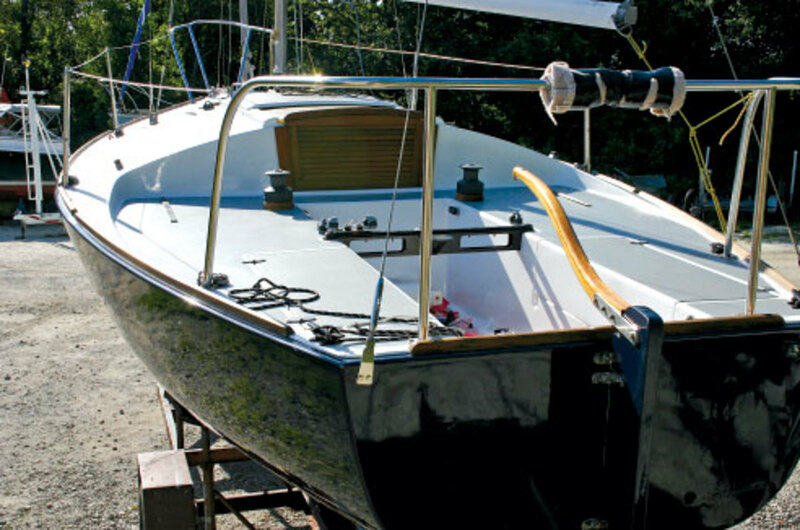 Several years ago we restored a 1983 J/22 and we equipped it with all Harken gear. Everything worked perfectly and we were delighted with the result. But since then we’ve had our eye on Ronstan’s OrbitBlock line, and we decided we would try them for the sail-control gear on the J/24. David’s brother Mike put a lot of thought into the details of the new cockpit layout. Because he usually steers, he wanted the mainsheet to function from any angle with the crew up on the rail. He also wanted to be sure that the helmsman would be able to use the system easily in all conditions. On a J/24 the cockpit is divided by the mainsheet traveler. Most of the time the helmsman sits near the mainsheet and steers while trimming the main. Because the original wooden mainsheet traveler support was cracked, we discarded it and got a new metal support from Hall Spars. Installing the support was easy because it dropped into the established notches on either side of the cockpit. Unfortunately, bolting it in place was another story. The problem was that the old traveler support had been removed more than once by one or more of the previous owners. In the process they had created a number of holes that weakened the structure. To build things back up again we first ground around the outside of the holes with a Dremel tool. Then we ground off the fiberglass inside the deck structure and patched the areas with epoxy and glass. 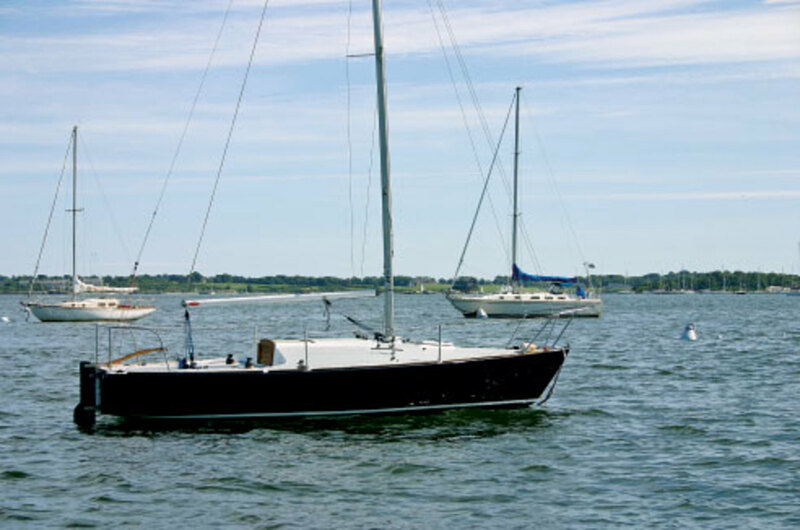 When everything had cured we were ready to bolt the new mainsheet traveler support in place. The Hall Spars box-shaped support unit needed two holes at either end, which we drilled using the track as a guide. After that we drilled out the deck notches to fit. Midway through the installation, we realized it would be easier to mount the mainsheet track on the support before we bolted it in place because the only access to the support unit’s bolts is inside the molded box-shaped support in the cockpit. After a few false starts we finally got the support unit and traveler mounted and backed properly with appropriately sized bolts. We then installed the other parts of the traveler, including the end stops, traveler car and traveler blocks. 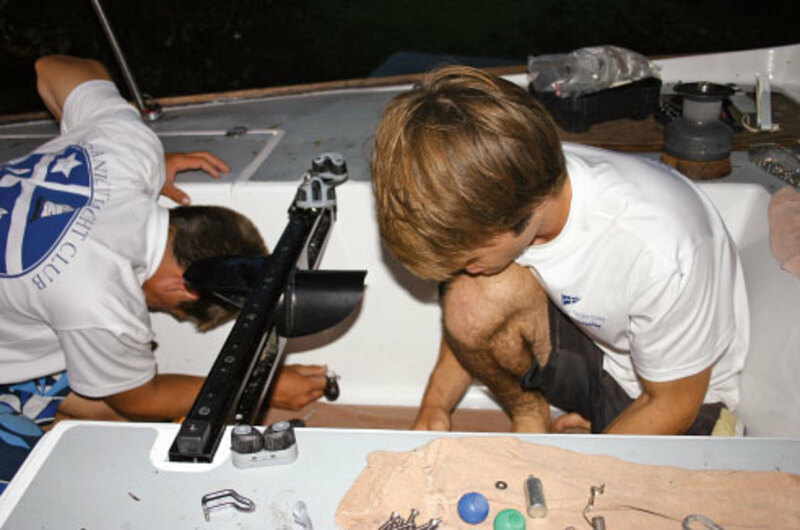 When it came time to install the rigging, we made sure that all control lines, including those for the backstay, could be operated from either side of the boat. We decided to run the backstay controls under the mainsheet traveler so the helmsman could pull on them without having to lean into the cockpit. We put the traveler control lines on the after side of the traveler to help clean up the cockpit and make it easy to use. The Ronstan mainsheet traveler car moves easily under load. This is an important feature whenever the helmsman is trimming the main, because it means he or she will not lose steering concentration. 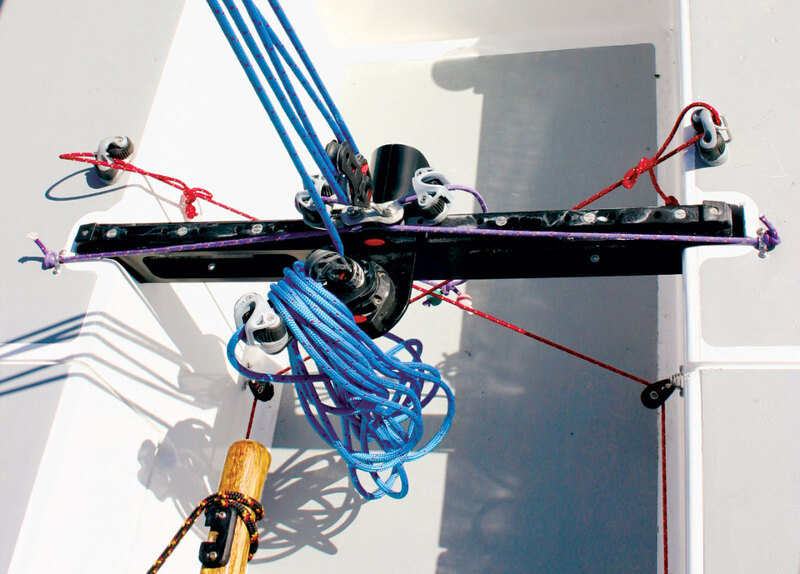 We achieved similar results when we installed the Harken traveler on the J/22. The performance improvement on both boats has been enormous. We decided to use a four-part mainsheet, the maximum allowed by the J/24 class rules. The auto-ratchet feature on our Ronstan block is barely noticeable in light air, but as the wind and load increase, the ratcheting power increases as well. We finished the refit at the end of last summer, and the boys were able to race the boat twice. The first race was in the very competitive local J/24 fleet, and they finished third. The second was a longer race in which they finished first among all the entries under 30 feet. Not a bad start for a 31-year-old boat. 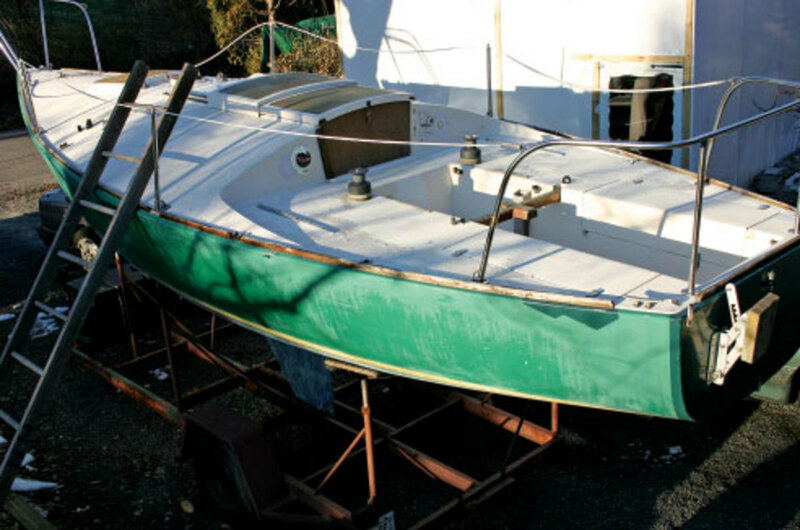 It demonstrates pretty clearly that it is possible to make an old boat competitive again. The restoration is complete. Time to go racing!